1 wild symbol appearing randomly anywhere on the reels in the main game and in free spins activates a multiplier ox x1. The total multiplier value is equal to the number of simultaneously appearing wild symbols, from a minimum of x1 and maximum of x5. At the start of free spins, a wild symbol automatically appears in the centre position of reel 3 and remains on the reel until free spins ends. In free spins, wild symbols can appear as single symbols or stacked symbols of 2 and/or 3. The Lost Island slot game comes with the usual higher than average payout percentages for which all NetEnt design slot games are famed, and as such it is a slot we are more than happy to showcase to you. The 20 paylines on this slot are all optional and the coins you can play per line start at just 0.01 and rise up to coin values of 0.50 plus you can also play with 10 coins per line in play which when you do so and play maximum bet spins will see you having to pay a high rolling 100.00 per spin. 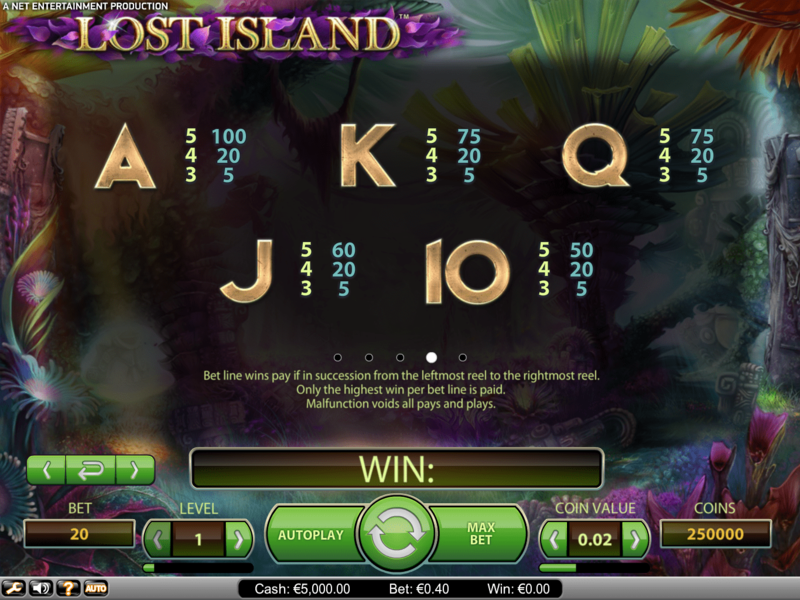 You can bag a small fortune playing this Lost Island slot game for the maximum payout per spin is a massive 500,000 coins. The base game jackpot is some 500 coins when played with just one coin in play on each payline, so when playing ten coins per line per spin you can win a base game jackpot worth 5000 coins. You will find Icon and Jewellery symbols on the reels of this Lost Island slot along with a Drum symbols and the usual Playing Card themed reel symbols.